New Florida Public Records Law Impacts Government Contractors - Martin|Hild, P.A. Private entities that enter into contracts with governmental agencies should take note of the newly-enacted Section 119.0701 of the Florida Statutes. This Section took effect July 1, 2013, and addresses a private entity’s contractual obligations regarding the maintenance of, and access to, public records. This new Section requires Florida state and local public agencies to include certain provisions in service contracts confirming the contracting entities’ obligations under the Public Records Act where the contracting entity is acting on behalf of the public agency. This new Section, however, does not appear to expand the applicability of the Public Records Act to private entities contracting with Florida public agencies. In other words, contracting entities that are subject to the provisions of Section 119.0701 were already obligated to comply with the Public Records Act. The wrinkle is that the new Section creates an enforcement mechanism that did not exist prior to its passage. If the contracting entity does not comply with these contractual provisions, Section 119.0701 requires the public agency to enforce the contract provisions in accordance with the contract. This could mean consequences for the contracting entity ranging from the risk of contract termination or default to potential financial penalties. In addition, as any person can submit a public records request, public records issues can easily become the target of litigation. The enactment of this new Section, along with its related publicity, may result in increased public records and associated litigation directed at the contracting entity. Public Records Act Section 119.12 provides for the recovery of attorneys’ fees in a civil action against the public agency should it fail to enforce the contract provisions. The contracting entity may ultimately bear responsibility for those attorneys’ fees if indemnification or similar provisions exist in the contract between the public agency and the contracting entity. 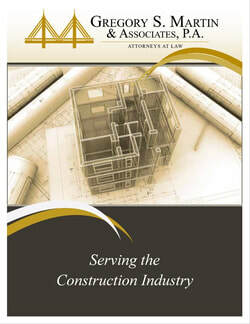 ﻿﻿If you are a contracting entity (Construction Manager or Engineer, for example) that provides contractual services to a governmental entity in ﻿﻿Florida, there are two important considerations. First, it is prudent to clearly separate all other documents, work files and records of your entity from ﻿﻿those associated with the specific contract work being performed for the governmental entity. Otherwise, this other documentation may itself become subject to disclosure under the Public Records Laws. Second, to the extent that certain information is subject to the Public Records Laws, failure to abide by the maintenance and disclosure provisions regarding that information could subject you to punitive consequences and potentially attorneys’ fees. Disclaimer: This article is for educational purposes only and is not legal advice. Seek the services of competent legal counsel to address your specific situation or issue.